When Tech N9ne set out to shatter records on his Hostile Takeover 2012 Tour, he knew he had to recruit the best live performers the game had to offer. Enter Cleveland’s Machine Gun Kelly. After meeting the young Bad Boy emcee, Tech N9ne took it upon himself to travel to an MGK show and watch the charismatic star in his element. The experience proved to be enough for Tech N9ne and Strange Music to invite MGK out for the biggest hip hop tour of the summer. Just like that, MGK went from being in the crowd at a Tech N9ne show, to co-headlining with the indie giant. Tune into MTV2 on Sunday, November 25th at 12:30PM CST/ 1:30PM EST for Tech N9ne’s Hostile Takeover: The Story Behind The Tour and find out just how wild things got when MGK entered Strangeland! 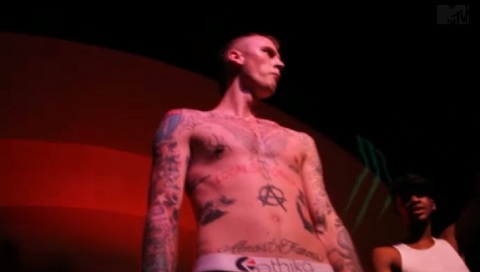 Did you see MGK live on Tech N9ne’s Hostile Takeover 2012 Tour?